You may recall that Miranda July is doing an email art project this summer in which a select group of people she knows release random, boring emails they've sent to people in their inner circle to the general public. This week's batch of words are about money; through them, we learned that Kirsten Dunst recently sold a car, Sheila Heti had some problems pitching a story to Glamour and Lena Dunham chose not to buy a very expensive Swedish couch. 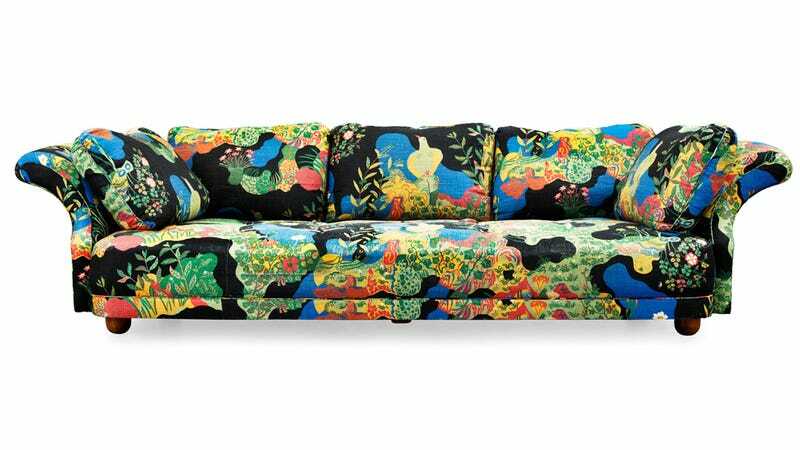 In April, Dunham decided that the famous Liljevalch sofa (pictured above, though we're guessing she was looking for a different color or pattern) was out of her price range. The price to make the Liljevalch Sofa is $14,878.93 plus the fabric which is $283.56 per meter and we would need 20 meters of fabric. So the entire cost of the couch would be $20,554.39. Shipping the sofa: It will take between 16 and 20 weeks to make and ship the sofa to us (from Sweden and will cost $3,080.85, plus $400.00 in customs charges. My friend Jessica is buying my car for 7,000 I gave her your info for payments. She's going to pay 2,000 up front and then pay the rest as fast as she can. Don't know the paper work involved, but Warren mentioned he had something. "Well, you are asking the wrong person about how to make money. I have less than $1000 in the bank and no credit card debt and no savings. I am hoping that my new book will sell in the States and elsewhere in the new year to save me. Celebs, They're Not Just Like Us: Week 1 is officially complete.